Property Size 378 sq. ft. This Purgatory Townhouse Studio condo is located at Purgatory Resort. Queen Murphy bed and full size sleeper sofa. Fully equipped kitchen and full bath. Wood burning stove and balcony off of living room. Walk to the main lifts and ski plaza. Great for summer activities too. Hiking and mountain biking trails close by. Drive the San Juan Scenic Byway to Silverton and Ouray. Soak in the hot spring at Trimble Hot Springs. Enjoy the peace and quiet of the mountains any time of year. 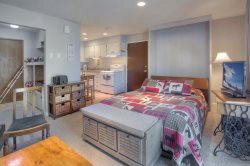 This spacious studio condo is located within walking distance to the ski area at Purgatory Resort. A queen size Murphy bed and a full size sleeper sofa sleeps 4 comfortably. A full kitchen with bar seating. In 5 minutes you can walk to the main ski plaza to catch the lifts for a day of skiing or to enjoy a meal. In the summer hiking and mountain biking trails right outside your door. A short drive will take you to more trails and some great fishing spots. Purgatory Townhomes are condominiums located at Purgatory Resort Ski Area just thirty minutes north of Durango Colorado and about forty minutes drive to Silverton Colorado over some of the most scenic roads in the Rocky Mountains of the Western United States. The Resort offers great skiing and snowboarding in winter plus summer activities including mountain biking, hiking and the 'Music in the Mountains' summer music festival. The Townhomes are on the 'Sheol Street Loop', just past the main Resort Plaza area and about a one block walk to the ski lifts. Enjoy the peaceful quiet of the surrounding San Juan Mountains. Or play hard on the fantastic mountain biking, hiking and horseback riding trails just minutes away. Take a drive on the San Juan Scenic Highway and visit Silverton, Ouray or Telluride. Take a day to visit Mesa Verde National Park or ride the Durango Silverton Train. Visit Durango for great shopping and fabulous restaurants. Soak in the natural springs at Trimble Hot Springs. It's all here for you to enjoy the perfect vacation. Enjoy skiing, sledding and snowmobiling in the winter. Summer offers peace and quiet as well as access to many trails for mountain biking, hiking and horseback riding. Historic Durango Colorado is only a 25 minute drive away and Silverton Colorado is 30 minutes to the north along the Scenic San Juan Byway. A great vacation rental to enjoy the Colorado Rocky Mountains. Available by the month April - November. Please e mail or call for pricing. Team members were great to work with! We had a blast!! Fantastic location, and would definitely stay here again. What a great time we had in our trip! This condo is perfectly located in one of the most beautiful places between Durango and Silverton. The condo is cozy and the hosts are very friendly. I would recommend this place to anybody. The condo was exactly as described. Murphy bed was comfortable but the pull out couch was not. The condo was clean. Great being near the ski area at such a low price. Great place!!!! This place was just as it was described! It had lots of closet space and a LOT of extra towels, pillows and blankets - if you needed them! We would stay here again!